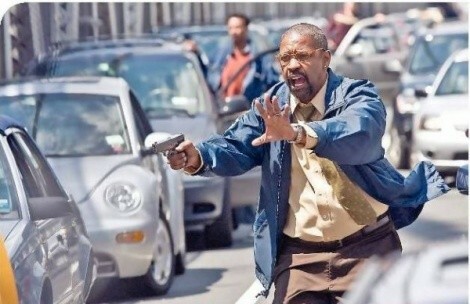 Miss Direction: Tony Scott continues hijacking Denzel Washington’s career. Look, I’m not making any inappropriate allegations. All I’m saying is that if Tony Scott does have any scandalous photos of Denzel Washington, that might explain a lot. It’s not that Washington suddenly turns into a hack-by-association in his Scott-directed films. Here he plays Walter Garber, a New York Transit Authority employee who has the bad luck to be on the other end of radio dispatch when a subway train is hijacked. A guy calling himself Ryder (John Travolta), leading a quartet of gunmen, has given the city one hour to deliver $10 million. While fears of a terrorist attack spread, Garber and Ryder play the kind of cat-and-mouse game that you get in movies of this kind. The original 1974 version of John Godey’s novel was no masterpiece, but it was a fascinating time capsule of decaying mid-’70s New York City, and it was ahead of its time as a kind of straightforward, Law & Order-style procedural where nuances of character were utterly wiped away in favor of brute plot mechanics. In screenwriter Brian Helgeland’s version, Garber gets a back-story involving allegations of accepting bribes; Ryder similarly switches from a coldly analytical mercenary to a guy with an ax to grind. More complex characters, better story … right? Not necessarily. As gifted as Washington may be as an actor, he’s almost too charismatic to play the kind of beaten-down bureaucrat demanded by this twist in the character. Sporting a paunch and ugly clothes that appear to have been stolen from Walter Matthau’s Garber in the original film, he can’t sell ordinariness, especially when he’s later required to turn into an action hero dashing through New York City traffic. Ryder becomes an even bigger disaster, because making him a high-strung guy means giving Travolta license to go into “hammy psycho” mode. Sometimes, as in something deliriously over-the-top like Face/Off, that persona can work. And then there’s the Travolta of Battlefield Earth, who seems to believe that screen villainy involves as much shrieking as possible. Guess which one cavorts through Pelham 123? Then again, Travolta could just be taking his Lack of Subtlety 101 cues from his director. Tony Scott has certainly made a successful career for himself over the past 25 years since becoming the first of the directors from the Jerry Bruckheimer stable—which also produced Michael Bay, Dominic Sena and other devotees of heavily filtered lighting and snap-cut editing— to hit the big time. But his trademark visual shenanigans have grown increasingly tiresome, to the point that it becomes almost impossible to care about anything that’s actually going on in The Taking of Pelham 123. Scott jerks us through the air with panoramic establishing shots, does slow-motion whip-pans through Manhattan streets, offers up blurry and oversaturated interstitial snippets and generally acts like a 3-year-old who doesn’t think his picture is actually finished until he’s used every crayon color in the box. It’s a style that’s supposed to generate a sense of kinetic excitement; instead, it generates a profound desire to check the director’s meds. It’s easy to understand the lure of remaking this particular thriller for the post-9/11 era, when it feels like we’re all just one incident away from running screaming into the streets. But Scott hasn’t made a film about hysteria. He has simply made a hysterical film—not in the sense that it’s funny, even unintentionally, but in the sense that you just want to grab it by the shoulders, jam it into the nearest chair and tell it to settle the hell down. Whatever gifts as a storyteller Denzel Washington appears to see in Tony Scott over and over again, he needs to convey them to the rest of us, before it’s his career that winds up hijacked.